If I had to pick my favorite Instant Pot Indian recipe, this is it! For those of you who’ve been following my blog, you might remember my mom’s Indian chicken curry (stovetop) recipe. As much as I love that recipe, I also love the Instant Pot version of Indian chicken curry and so does everyone I share it with – it’s comfort food; just add some rice or naan and that’s a meal right there. One of the first dishes I wanted to try out when I first got my Instant Pot was my mom’s Indian chicken curry. 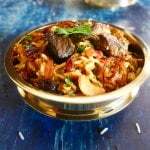 If you’re looking for a delicious Instant Pot Indian recipe that’s sure to please, you’ve found it! 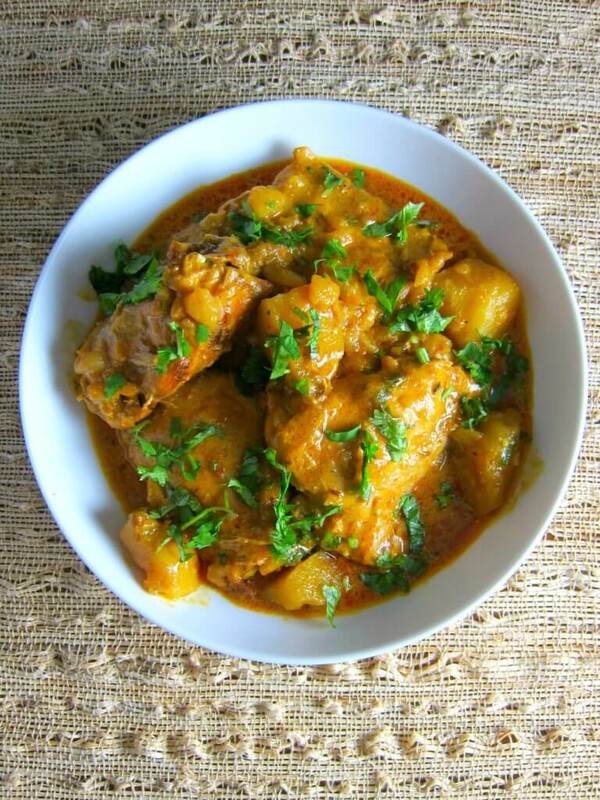 Many people who’ve only had Indian food in a restaurant may be surprised to see Indian chicken curry with potatoes. But potatoes are a common addition to chicken curry recipes made in Indian kitchens. Give it a try! Adapting family favorite recipes to the Instant Pot is easy enough if you can figure out the amount of water and the time to cook. Sometimes I get it on the first try and sometimes I have to tweak it a bit. My ever-patient family sometimes has to eat the same thing a few days in a row! But you’re lucky, because we’re doing the research and you get to try out the tested recipe. Anyone who loves Indian curry recipes is going to love this Instant Pot Indian chicken curry recipe. My favorite way to eat this Indian chicken curry is with rice and papadum (thin crisp wafers). I like to crumble the papadum into the rice and curry! – One of the changes I made for the Instant Pot version is to use bone-in chicken. I feel that bone-in chicken thighs and drumsticks cook so well and quickly in the Instant Pot, and are so flavorful. If you’d like to use whole boneless chicken, you can reduce the chicken cooking time to 10 minutes total. If you want to cut up the chicken, you can cook the potatoes and chicken together for 5 minutes. – The other change I made was that I added a thickener at the end, because the curry was not thick enough for my taste. The Instant Pot allows dishes to cook with hardly any water loss, so the end result is not as thick as when cooked on the stove. You might like it just fine, so feel free to omit this step. You can thicken the Instant Pot chicken curry in one of two ways: either by cooking down the liquid in saute mode at the end, or by adding a thickener. I chose to add ground up cashew nuts, which I do with the stove-top version also. This is a trick my mom taught me. You can add coconut milk, coconut cream, heavy cream or purchased cashew butter, if you prefer. 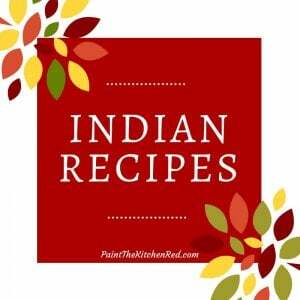 If you enjoy Indian food, you can try my other Instant Pot Indian recipes like Instant Pot Indian Beef Curry and Instant Pot Aloo Gobi | Indian Cauliflower with Potatoes. If you’re new to the Instant Pot and aren’t familiar with how to use it, please read the Instant Pot DUO Beginner’s Quick Start Guide or the Instant Pot ULTRA Beginner’s Quick Start Guide first and then come back here to learn how to make Instant Pot Indian Chicken Curry. Melt butter and add cinnamon, cumin seeds and bay leaves and stir till fragrant, being careful not to burn. Add onions, garlic and ginger, and saute till golden brown, about 7 minutes. Add tomato paste mixture to the Instant Pot and stir. Saute until tomato paste is cooked, about 3 minutes. If it sticks to the bottom, add a tablespoon or two of water. Press ‘Cancel’ to turn Instant Pot off, otherwise spices can burn. Add coriander, turmeric, black pepper, cayenne, salt and stir till fragrant. Deglaze the pot with water or broth so there’s nothing stuck to the bottom of the inner pot. Press Saute again to turn on Instant Pot. Add chicken pieces, stir to coat with spice mixture. Press ‘Manual’ or ‘Pressure Cook’ and ‘+’ or ‘-‘ until display reads ‘9’ (9 minutes). The display will count down from 9 to 0; it will switch to ‘Keep Warm’ mode and display ‘L0;00’. Add cubed potatoes and garam masala to Instant Pot. Close Instant Pot Lid and make sure steam release handle is in the ‘Sealing’ position. Press ‘Manual’ or ‘Pressure Cook’ and ‘+’ or ‘-‘ until display reads ‘6’ (6 minutes). The display will count down from 6 to 0; it will switch to ‘Keep Warm’ mode and display ‘L0;00’. Open Instant Pot and add cashew paste to the Instant Pot chicken curry and stir to combine. Press ‘Saute’ and heat through. 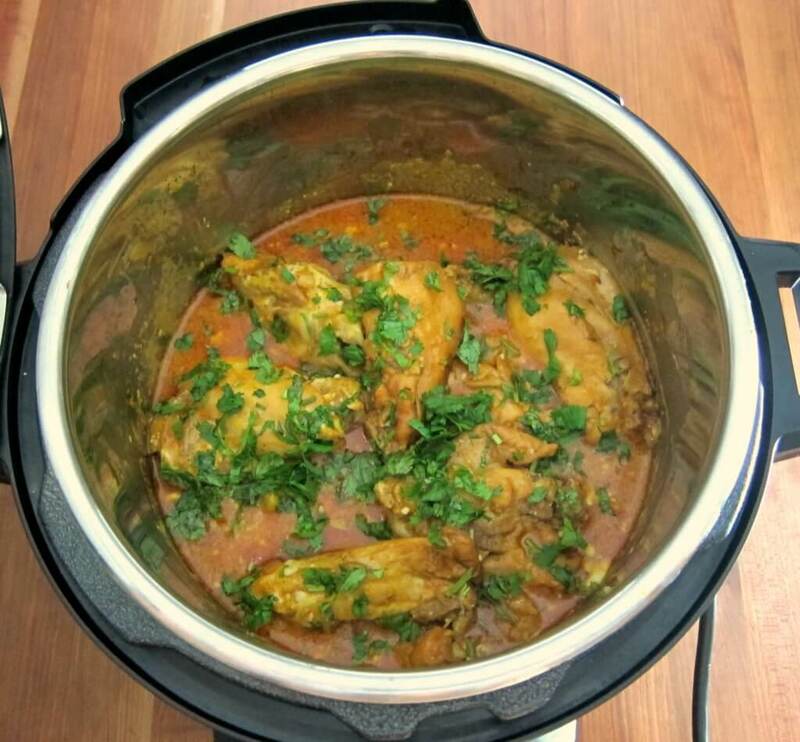 Turn off Instant Pot, sprinkle Instant Pot Indian chicken curry with cilantro and serve with rice, bread or naan. This Indian Instant Pot chicken curry is flavorful and creamy and is sure to please any Indian Curry lover. In 'Saute' mode, melt butter. Add cinnamon, cumin seeds and bay leaf and stir till fragrant, being careful not to burn. Add onions, garlic and ginger, and saute till golden brown, about 7 minutes. Add tomato paste mixed with 2 Tbsp water and stir. Saute until tomato paste is cooked, about 3 minutes. If it sticks to the bottom, add another tablespoon or two of water. Press 'Cancel' to turn off Instant Pot, otherwise spices can burn when you add them. In 'Saute' mode, add chicken pieces and stir to coat with spice mixture. Add cubed potatoes and garam masala to chicken and stir gently. Add cashew paste, stir the chicken curry and heat through in 'Saute' mode. Recipe has been modified to pressure cook the chicken for 9 minutes rather than 15 minutes before adding the potatoes for a further 6 minutes. ** To make cashew paste, blend 1/4 to 1/3 cup cashews with water to make a thick (like peanut butter) paste. Substitute cashew paste with cashew butter or heavy cream or coconut cream. You can also thicken the curry by cooking down the liquid at the end, in 'Saute' mode. 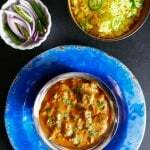 If you prefer a thin curry, you can omit the thickener altogether. Thank you Barbara! I am having fun with it. The other day I actually used my stove and it felt weird! Donna, the cream is just a suggestion to substitute for the cashew, which is what I usually use. You would use about the same quantity i.e. a couple of tablespoons. One shortcut I take sometimes is to chop the onion, garlic and ginger in a mini food processor. This looks delicious! The instant pot looks so fast and easy; I have got to try one! The nice thing is you can turn it on and leave it – that’s pretty convenient for when you’re shuttling kids around! I love, love, love curry! This is a great recipe, very detailed. Pinning for later! So glad – keep me posted on how it goes. 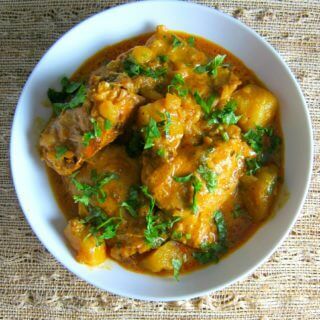 I love chicken curry and your recipe looks so amazing! I think I may need to get an Instant Pot now that you’ve shown me how easy it is to use! Cashew paste! I will need to look into this and find it! 😀 Thanks for this wonderfully comforting curry recipe. I am so excited to try this. You’re welcome! Cashew butter works just fine too. Warm curry is exactly what we need here in Denver to combat the snow!!! Looks ah-mazing! Thanks Mikaela – just as cold and dreary here! Romain, I used to use a stovetop PC, and I think you can reduce the time in my recipes by about 15 to 20%. If it’s undercooked, just bring up to pressure and cook for another couple of minutes. I would go by the timings in your PC manual. I think the recipe will turn out great – but you will notice it’s more liquidy at the end, so you’ll have to thicken… Let me know how it turns out! Looks delicious!! I love chicken curry! I’ll have to try this soon! I just love curries, especially in the colder winter months or when it’s dreary and raining out. I don’t have an instant pot, maybe one day I’ll get one! But it looks like the ingredients for the sauce would be great for a slow cooker too, so I can’t wait to give it a try! Alison, I have a stove-top version of the same recipe. There’s a link on this post. Maybe you can try that one out. But yes, I think you can definitely use the slow cooker. You might need to up the spices maybe? I had chicken thighs and wasn’t sure what I wanted to do with them. I had all of the ingredients on had and can’t wait to eat it, it smells so good. Thank you for sharing. That’s wonderful -I hope you enjoy the chicken curry! And that’s pretty impressive that you had all the ingredients on hand – that never happens to me LOL! Made this tonight. WONDERFUL! I’ve made the stove top version and loved it, but I think this is even better. The chicken just falls off the bone. And the spices…perfection. I noticed that you omitted the mustard seed… I have to say it was delicious even without the mustard seed. Thank you Neena for another memorable meal and making my family think I’m a good cook. Thank you for the kind words, Monica -so glad I can help out in a small way! I did omit the mustard seeds because I do that sometimes to change up the flavor. You can definitely add them in at the beginning, just use a good cover to prevent splatters! Hello, I’ve read a few of your recpies and have noticed that you often list cilantro an an ingredient in your indian dishes. My girlfriend hinks cilantro tastes like soap; can you recommend a different herb as a substitute for these dishes? Good question. But a difficult one 🙂 I don’t think anything substitutes for the taste of cilantro. I’ve heard that some people are genetically predisposed to not liking the taste. I would just leave it out, and sprinkle it on individual servings if it’s a curry dish where it’s added at the end. So strange how the human body works! Can’t even imagine not liking cilantro! I put it in everything (to a fault!) Since cilantro is actually from the coriander plant, I wonder if coriander seed/powder has the same effect on you… Keep me posted on how the recipe turns out, and thanks for checking in. Just made this recipe with frozen chicken breast & changed the cooking time to 30 minutes manual to accommodate for the frozen meat. Otherwise, kept to your recipe. Had signifant liquid due to the meat being frozen, but burned off half the liquid via the Sauté mode as you suggested. Turned out delicious & the meat was incredibly tender & easily shredding. Thank you so much for sharing this. I’m new to the instant pot & cooking Indian cuisine for myself since my mother doesn’t live close. I look forward to making more of your recipes. Thank you! That’s wonderful! Thank you for sharing info about how long it took to cook frozen chicken for the curry. I know what you mean about mom being far away – there’s nothing like mom’s cooking! I miss my mom’s cooking too. Making this right now and found that 1/2 c liquid wasn’t enough to get to pressure using boneless thighs (it’s what I had available). Just popped it open and added more chicken broth. Waiting to see if that was enough. Thanks for the feedback. Yes, with the Instant Pot it is sometimes trial and error. You did the right thing, I hope you were able to enjoy the end result. Maybe next time start with 3/4 cup broth. And of course, I have to ask: you’re sure the pot was sealed properly? When I checked on it, it was counting down but had not come to pressure (had only gone about 2 min like this). Still turned out amazing and was a big hit. I didn’t have the cashew paste on hand so thickened with corn starch and the flavors were out of this world and the hubby didn’t complain on the amount of extra cause. Yay! So glad it worked for you Donna. And thanks again for sharing your experience. I made this with boneless, skinless, chicken thighs and it worked perfectly with 1/2 cup of stock. Hi, I recently discovered your blog and I Love it!! You make recipes so easy to follow. I wish I could just cook with you in the kitchen :). Please keep posting. It would also be great if you could do different dal recipes and khichidi. Hi Shristi, thank you so much for the comment! It really means a lot. If you’re using bite-size pieces of chicken, I would try to do 6 minutes, and then add the potatoes as usual. You might need about 1/4 cup of broth or water if you find that it’s not pressurizing when you cook the chicken. Good luck! Thanks Neena! I actually made it today and it turned out awesome! I had bigger pieces of diced chicken, and I cooked it for 10 mins. Maybe a little less would’ve been good too, but my family loved it! I don’t usually add potatoes to my chicken curries, but it tasted great the way you had it. Just made this and it was delicious. A keeper recipe for sure that will be added to my meal rotations. I had to make sure to save some for my 2 year old for tomorrow because I know she is going to love it too. I’m so glad you liked it! Your two year old sounds like she likes all types of foods – good job, mom! Glad it worked for you, Emily! In India, we serve plain yogurt with most meals and sometimes stir it in with curry and rice. Your kids have the right idea! I tried your chicken curry with minor modifications. Used skinless chicken legs cut in half and coconut milk to thicken the curry. Used curry leaves instead of cilantro. Came out excellent. Thanks for doing the homework with the instant pot which made it easy for us to follow the recipe. Thanks for the feedback, so glad you liked it – and you are most welcome! Will this be good with skinless boneless thighs? Hi Becky, it would work fine, but make the chicken cooking time 10 to 12 minutes, depending on how large the pieces are. Hi! This looks fantastic! I’m wondering what I would do for timing if I want to leave the chicken out. I was going to add veggies in it’s place like cauliflower and perhaps some tofu. Would I still cook the spices together before I put in the potatoes and garam masala? Thanks for any tips you can offer. Hi Fran – yes, cook the onions, tomatoes and then spices so they can ‘fry’ in the butter/oil. Then add your veggies and cook for the appropriate amount of time. So in case of potatoes and cauliflower, cook the potatoes for 5 minutes and quick release. Then add cauliflower and cook for 0 minutes, quick release (I find that cauliflower gets too soggy otherwise). If it’s undercooked, just cook in Saute mode till done and the next time you make it, you can adjust the timings. This spice ‘masala’ is very versatile and can be used for any meat or vegetable dish. Feel free to ask if you have further questions! Fantastic recipe! I made this today with boneless chicken thighs and heavy cream in place of the cashew cream and it was amazing! I also added some frozen peas at the end during saute mode. Great recipe, thanks! I love the changes that you made and am really glad you liked it! Just came across the site looking for a chicken curry recipe to try out in my new Instant Pot! Thank you so much for this step-by-step tutorial! Many put recipes outthere but don’t tell you which settings to use high or low pressure and that’s frustrating for a newbie! Thanks for your kind words! I’m so glad it was helpful. Tomato red kitchen walls – wow, that was bold of you! I bought the new instant pot ultra and it doesn’t have a poultry button. Any suggestions what I should do? Rimmy, on the Instant Pot Ultra, just use the ‘Pressure Cook’ button and high pressure. Good luck and enjoy your new IP – I can’t wait to get one! This is a fabulous recipe. I have been making curries for years and with my instant pot, I’ve been struggling to get mine “authentic” enough — this one does the trick! I omit the potatoes in favor of other carbs, but this is the real deal. Well done! That’s fantastic Melissa! Thank you for the kind words. I sometimes add ‘saag’ (spinach) to the dish at the end and just let it cook through. Very tasty and healthy too. I also find that this curry tastes best the next day. Thank you so much for the wonderful recipe. My husband got me an instant pot in February, but I was not able to find a good recipe until I found yours. Your recipe was so easy to follow with step by step pictures. I had no trouble making this chicken curry. The chicken curry came out just perfect. I will definitely try your other recipe soon. Thank you so much!! I really liked the recipe. I may have added too much spices but still liked it very much. Any reason you add garam massala after cooking? I am thinking of trying this as add all spices in beginning and see how it turns our after sauteing the spices and onion to make the recipe even simpler. Any recommendations for any chutneys that would go well with this that can be ordered from Amazong? Hi Ika – I somehow missed your comment! I’m glad you enjoyed the curry. 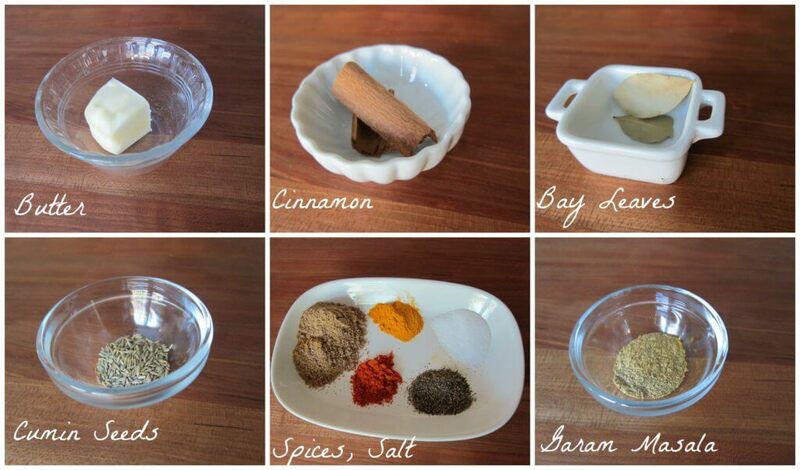 We typically add garam masala closer to the end of cooking because it retains the flavors. Actually it would be even better to add it to this curry after cooking the potatoes, while it’s simmering. If you wish to add it with the other spices, you can do that, but sprinkle a little more towards the end of cooking. I don’t normally serve chutney with this curry but you could do a nice cucumber raita – a yogurt relish. I can’t wait to try this recipe. It looks SO good! I really appreciate the details on using the Instant Pot with this recipe. So many recipes are difficult for those of us who are newer to the pot, because we don’t know what the abbreviations are, or we don’t know what buttons to push. I had to do a lot of research to find out that on the Lux, the manual is always on high. On the cilantro topic, my husband adores it! He asked me why I don’t like it. I said I don’t dislike it, but the only thing I can think of is that it reminds me a little of soap. I later read that 10% of people think it tastes like soap, and it’s genetic. I also wonder if there are other things the 10%ers have in common. Just a curiosity nerd! I hope you like the recipe! I keep posting the step by step instructions on all my recipes because I know there are always new IP users out there. It’s a time-consuming process, but I feel it’s much appreciated by people like you – thank you for commenting! I hardly ever cook anything on Low pressure, so I don’t think you’re missing out with the Lux model. And yes, although I can’t imagine cilantro tasting like soap, I get that people actually feel that way! Best curry chicken I’ve every had. Boneless chicken thighs also works well. Feel like I’m in India cooking with your mom when I make this recipe. Thank you for sharing your family recipe. Thanks for the compliment – you’re welcome. I’m so glad you like the recipe! This was the first recipe we made in our new Instant Pot. Used boneless chicken thighs and cooked them for 11 minutes. Thickened sauce at the end with about 2tbsp fat free plain Greek yogurt. Served chicken and sauce over white rice. Let me tell you – it was amazing!!!!!! The whole family loved every bite! Thank you for creating and sharing this recipe. We will definitely try your other Instant Pot recipes! 5/5 ⭐️⭐️⭐️⭐️⭐️! I’m so glad you liked it, Katie! Thanks for commenting – it really makes my day to hear from people like you. Please check in again when you try another recipe. If you like Thai curry, check out the Instant Pot Thai Red Curry. It’s really yummy and one of my favorites. I’ve just bought an instant pot and came across your chicken curry recipe. I’m using a 1kg of chicken boneless thighs , could you please tell me how much of the other ingredients to use to the weight of chicken because your recipe uses 1 and half kg of chicken. I’m going to cook this today . Thankyou. Hi Lorna – You can keep the measurements the same. My recipe is for bone-in chicken and you’re using boneless so I think it will work just fine. I make this recipe with boneless thighs and use the same quantities. Just reduce the cooking time. Good luck! I made the recipe this evening, with the only change being that I substituted natural peanut butter (all ground peanuts, no added fat) for the cashew paste. It was very good! The chicken was very tender and flavorful, as were the potatoes and other ingredients in the sauce. However, I never did get the sauce to thicken, even after boiling it on the Sautee setting for 20 minutes. Perhaps next time I’ll use slightly less water and corn starch as a thickener. Also, the curry flavor was not as infused into the chicken as I am used to from enjoying curry chicken in authentic Indian restaurants. Is the curry infusion into the chicken that Indian restaurants achieve only possible with slow cooking rather than the faster cooking that the Instant Pot allows? Again, it’s a great recipe, but I would like to learn how to make it even better! Hi Tom, thanks for your comment – no worries, I always like feedback! I think you should try and use less water next time, because it should not have been that liquidy. It’s a fine balance having enough water to reach pressure but not so much that it’s too watery. Having too much liquid is one of the top reasons for having a dish taste insipid. Maybe your chicken released a lot of liquid – was it frozen beforehand? Having a thicker sauce while pressure cooking would infuse more flavor into the chicken. Your tastes might also call for upping the spices. Also, this curry tastes really great the next day. Hope that helps and I’d love for you to try it again! The chicken I used (4 large bone-in thighs) was fresh, not frozen. I will definitely add less liquid next time. We enjoyed it tonight, and I bet next time we’ll enjoy it even more. Thanks so much for the recipe and especially the very clear directions in it! This was great! I used frozen chicken breasts and increased the time as a previous reader had done. Also, I have a sweet tooth, so we always put crema de coco (as is used in pina coladas) to make it tastier. Water chestnuts, California blend veggies, and cashews made the whole thing wonderful. Thanks again for your recipe! Marilyn, I’m glad you enjoyed the curry. You are so welcome – you made some very interesting adaptations to the recipe! Neena – I recently discovered your site and I am OBSESSED. I made this today and the red curry chicken a few days ago and both were insanely amazing. Thank you for this site! Can I request a lamb biryani instapot recipe in the future??? Hi Aruna! Thank you so much for the kind words. When I get comments like your’s, it makes my day! I will add your request to my list. I don’t dash out recipes on this site – I can barely manage a recipe a week; it takes me time to find something I and my family love, and then post it. There are many epic fails before a winner recipe 🙂 So I will work on the lamb biryani recipe and hope you’ll see it sometime this fall. This was delicious! Thank you! I’ve been a non cook my whole life but got the instant pot 2 months ago and have been inspired. Found your recipie and gave it a try based on all the excellent reviews. Outstanding! My 2 year old loved this too. I used chicken legs and those worked well. Looking forward to trying more of your recipes. Thanks again for your clarity and good taste. We tried this once and it was delicous, but we had omitted cashew pastebecause we didn’t have any. Can we substitute with Almond butter because that is something we readily have in the house. Hi Sandra, you can definitely substitute almond butter. The taste will be different, but good. Sometimes I use cashew and sometimes I just use thick coconut milk or cream. You’re mainly adding these to thicken. So the curry is very versatile. My instant put lux80 doesn’t have poultry. Should I just use meat/stew?? Hi Susan – Just use the ‘Manual’ button for the same amount of time. Hope you enjoy it. Would this recipe taste just as good if I used yams instead of potatoes, or would it make it too sweet? I have used sweet potatoes before when we were on a low-carb kick 🙂 and it was good but yes, a bit sweet (not too much). I really like to use spinach too instead of potatoes sometimes if you’d like to try that. Of course, adjust cooking time as needed. Good luck! We halved the recipe (so yields 3 servings) cos there were only two of us but we ended up eating everything anyway! Thanks so much for your DETAILED recipe. Makes first-time instant pot users like me so much easier!!! :> Looking forward to trying more of your stuff!! Hi Pei, I’m really glad you liked it. I hope you get to try out more recipes, and please keep the comments coming – I always like feedback. You could reduce the quantity of chicken but keep the spices at the same level too if you wanted it to be more flavorful and/or spicy. Enjoy your new Instant Pot! Tried this last night. Good. Wasn’t knock your socks off or anything but was good for dinner. I got the overheat error so I ended up needing to add a heavy 1/4 cup more stock to get it to come to pressure. So at the end I boiled a bit to get the liquid to reduce then stirred in some half & half w/tapioca flour to thicken and added a bit more garam marsala, salt & lemon juice to wake it up. This recipe looks fabulous! I’m very new to the Instant Pot so appreciate such detail with how to use it. I’m finding there’s quite a learning curve. One question: Do you have an idea about how long I would cook it with boneless, skinless chicken breast cut into smaller pieces? Thanks! I’ll be following you for sure for Instant Pot recipes. Hi Lori – I’m glad you found me! If you’re using boneless skinless chicken cut into bite size pieces, 4 to 5 minutes high pressure should be enough. Just made chicken curry and it was delicious, i follow the recipe as u wrote. At the end i just added Some spinach instead of the cilantro.. I do Spinach and cilantro both sometimes. So, good choice. Glad you liked the recipe, Sandy. Hello! This is fast becoming my favorite curry recipe. I have one question, though. I would like my curry to have more “sauce,” without diluting the flavor. Since I’ve already made the curry with the chicken and potatoes, is there a way I can just make more sauce to add to the leftovers? Maybe on the stovetop? Should I just fry the aromatics and spices like in the recipe, add liquid and voila? Thanks. Hi Amy, I’m happy to you like the recipe! The juices from the meat do contribute to the flavor of the gravy, but I think what you’re suggesting would work. I would use chicken broth for the liquid. Here’s the stove-top version of the recipe. Simmer the liquid to thicken, and add some cream or cashew paste at the end to thicken. I’m currently making this for the second time – my southern family including 4 kids all love it! They don’t like to deal with chicken bones so I used boneless and used the recommended cooking time of 10 minutes. It’s perfect! Thanks for a great go-to Indian curry recipe. I plan to try more of your recipes. Hi Karen – great to hear! You might like the shrimp and grits 🙂 I’m really glad you found my site and hope you get to try some other recipes. If you like Thai, those recipes are very delish. We follow a low carb diet. Would your recipe suffer if I replace the potatoes with cauliflower? Hi Rhonda, not at all. This is just something I grew up; my mom makes chicken curry this way. You can add spinach, or any other vegetable. If you do use a quicker cooking vegetable, I would just do a quick or natural release on the chicken, add the vegetable and boil till cooked. Otherwise you might get a mushy vegetable. Thanks for your question. 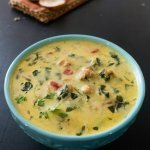 Could I double the recipe in my 8-quart instant pot pretty easily or do you recommend cooking two batches separately? I’ve made this once before and now I’m cooking it for a bigger group!!! So tasty! Hi Aruna – I think you should be able to double. The only caveat is that the chicken shouldn’t crowd the bottom of the pot such that there’s no circulation of liquid. You might be safer adding a little extra liquid? Hi I tried the recipe in my IP. When I opened the pot to add the potatoes and garam masala after 15 mins there was a brunt layer at the bottom. I added the chicken broth as recommended so not sure why it still burnt. Any recommendations or tips for next time? Hi Sharmila, do you have an 8 quart by chance? And did the Instant Pot seal properly? Did you deglaze the pot before adding the broth? I would add 1/4 cup more broth next time. and make sure the pot is deglazed. Let me know if you have further questions. My wife (Becky from LoveToBeInTheKitchen.com) and I have been waiting to get an Instant Pot so we can try your recipes. We finally got one for Christmas, and this will be the first we try! We’ve loved getting to know you better at the blogger meetups and through your blog. I just know this recipe will be a guaranteed hit. Thank you for sharing a part of your life with us through your recipe! Hi Derek and Becky – I’m so glad you got an Instant Pot. I hope you like the recipe, and let me know how it goes. Y’all are so nice, and made me feel so welcome that first time we met! So tasty! Thanks for including the times for boneless meat. Hi Rupa – you’re welcome, so happy you liked the recipe! Thank you for this recipe! It looks very authentic, and my mom cooks potatoes with chicken too, but she finds it hard to give me exact measurements. I want to try this recipe out next week with 2 lbs of chicken – a pound each of bone-in thighs and drumsticks. Before I do, I want to ask a silly question because I do not usually buy bone-in chicken. 1 Can I chop the bone-in thigh pieces into half across its width using a large meat knife so it cooks well with the drumsticks? I am not sure how people chop their bone-in thighs. 2 Can I keep all the measurements for the other ingredients the same for 2 lbs. of chicken? 3. If I am using fresh tomatoes instead of tomato paste, can I dice 2 medium tomatoes instead? Thanks so much for your help and for answering everyone’s questions so patiently. I’m loving your site!